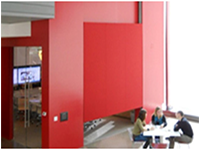 Novo Nordisk’s new state-of-the-art Conference Center is a high-tech hub of interdisciplinary collaboration and innovation. 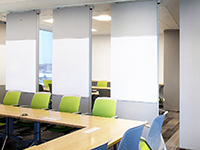 The new Conference Center is the most recent addition to the 2013 renovation of Novo Nordisk’s New Jersey Headquarters, which transformed a dark, concrete heavy building from the 1980s into an attractive, modern work environment featuring more glass and natural light. 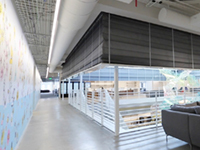 Aligning the new space with Novo Nordisk’s commitment to employee wellness would require balancing collaboration with the need for privacy and quiet time. 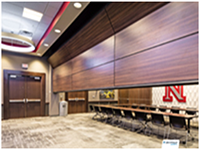 For this reason, the Conference Center would require maximum flexibility and include a variety of conference rooms, huddle rooms and open collaborative spaces. 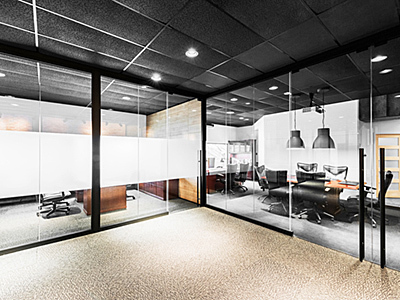 Award-winning Granum Architecture/Interiors specified two separate operable partition systems into the design of the headquarters nearly 40,000 sq. 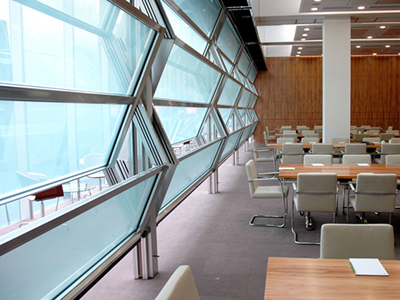 ft. Conference Center. 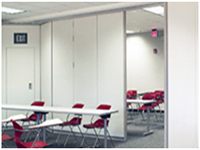 The flexibility of the operable partitions would help create dynamic spaces offering maximum opportunities for sharing knowledge. 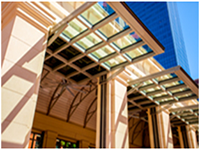 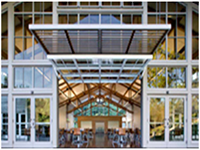 At the heart of the Conference Center is the Town Hall where corporate events such as the CEO’s quarterly meetings are held. 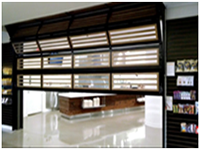 Two 975 sq. 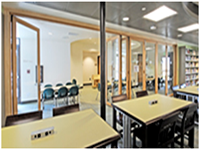 ft. breakout rooms flank either side of the Town Hall. 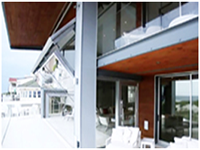 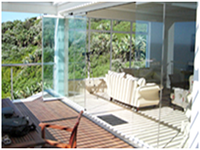 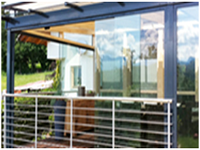 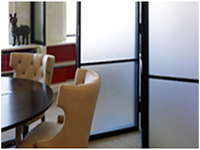 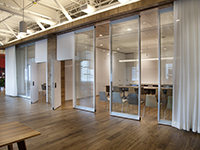 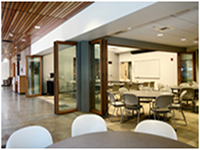 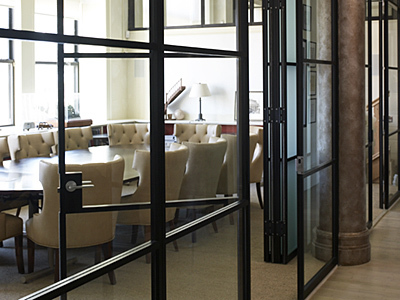 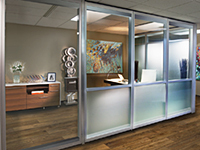 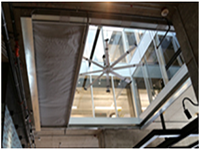 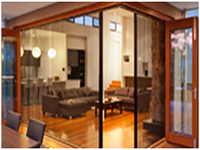 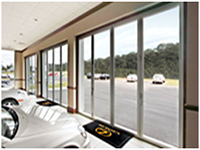 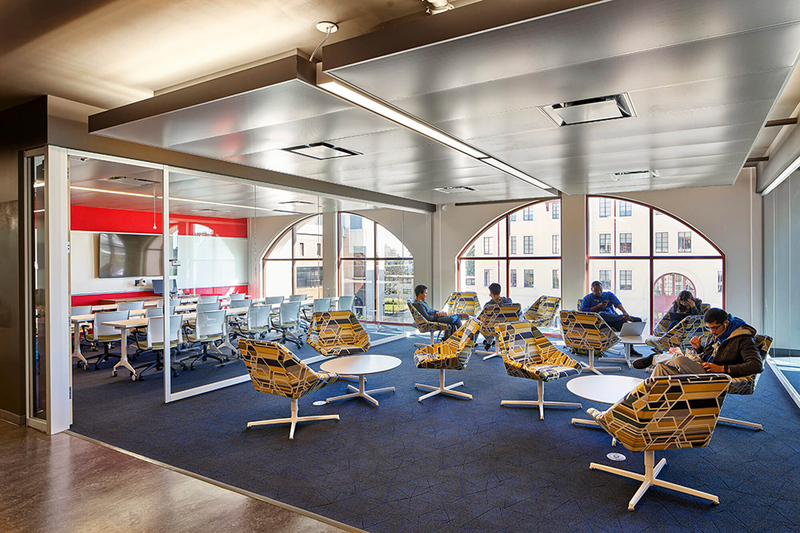 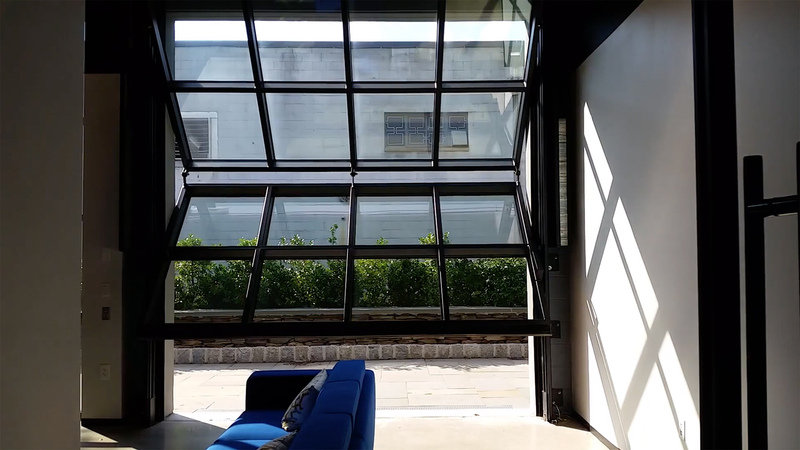 Each room was fitted with a 29′ x 8’2″ Modernfold Acousti-Clear glass operable partition. 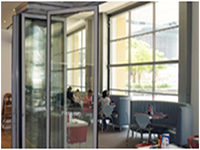 The paired glass panels, with automatic top and bottom seals, quickly and easily allow the breakout rooms to open or close to the Town Hall when desired. 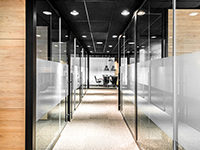 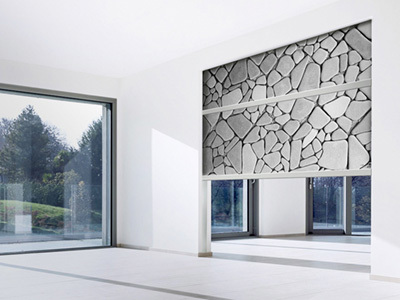 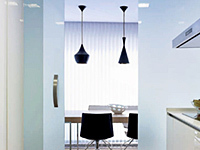 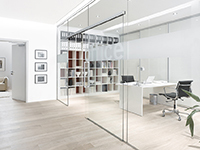 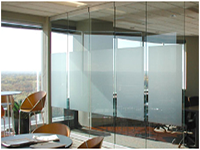 The Acousti-Clear 45 STC rating is among the highest available in glass partitions. 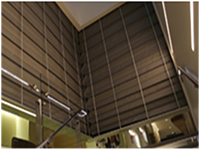 The powder-coated aluminum rails and applied custom graphics, featuring the faces of patients who have been helped by Novo Nordisk, demonstrate the range to which Acousti-Clear can adapt to an environment’s design aesthetic. 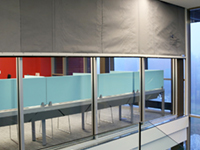 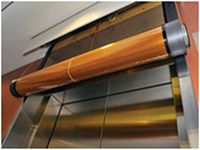 Adjacent to the Town Hall is the large conference space where six Skyfold Classic 51 vertical retractable partitions were specified. 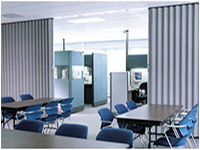 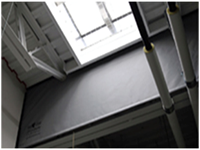 All six of the electrically operated 9′ tall partitions can be retracted into the ceiling above to take full advantage of the entire 128′ x 48′ space. 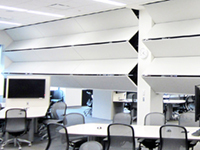 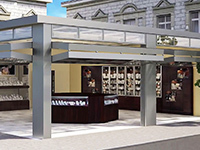 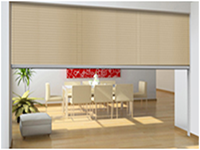 With the Skyfolds engaged, the space can be divided into varying configurations of up to four 32′ x 48′ rooms. 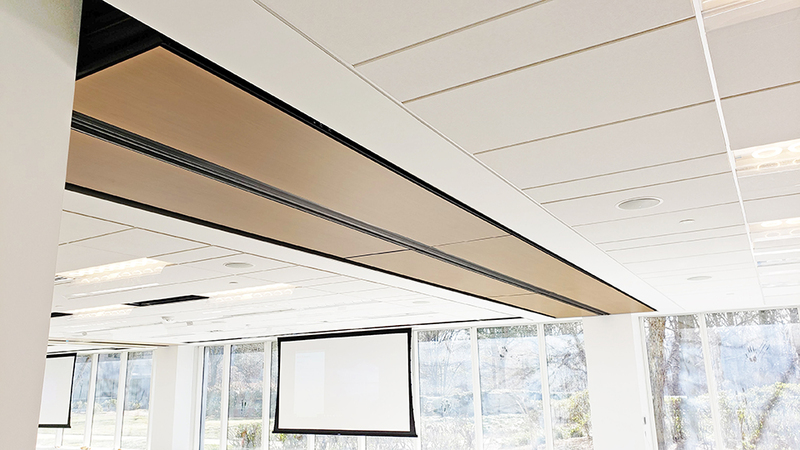 The 51 STC rating ensures superb acoustical control while custom wood panels, black trim and seals add to the attractive modern aesthetics. 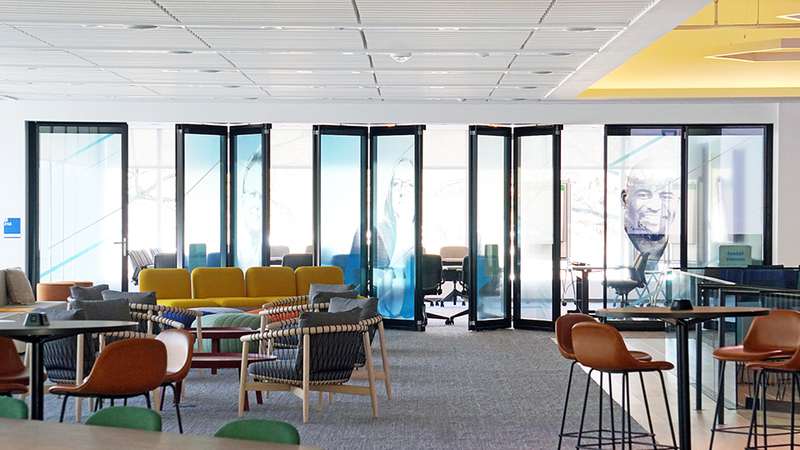 Novo Nordisk’s new Conference Center is a stunning example of a highly flexible work environment designed to meet the rigors of the innovation process. 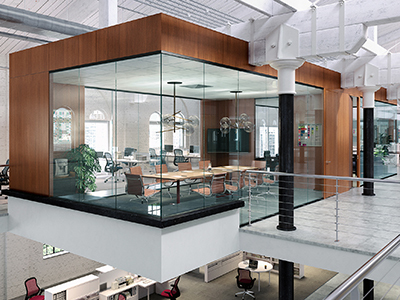 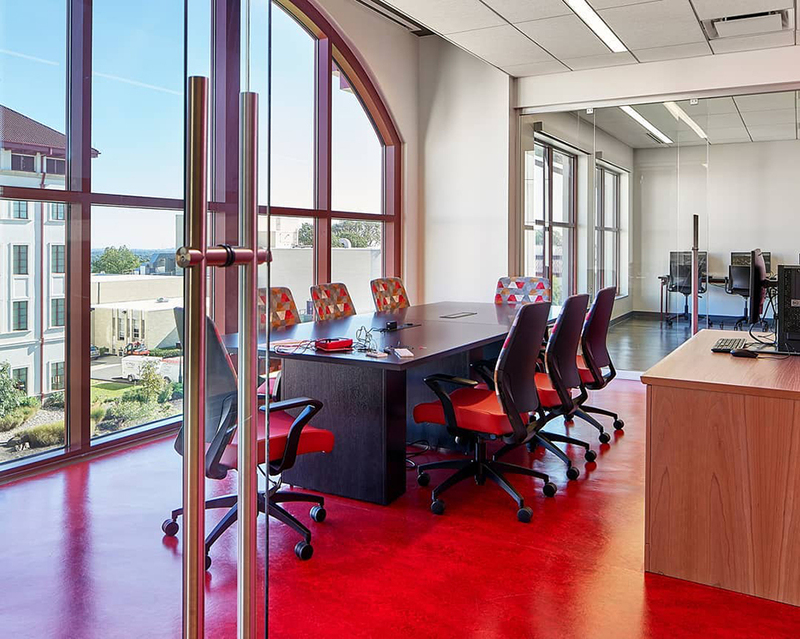 In addition to promoting creativity and collaboration, the openness of the spaces and positive daylighting effects of glass contribute to employee wellness and workplace satisfaction.